This antibody was raised by a genetic immunization technique. Genetic immunization can be used to generate antibodies by directly delivering antigen-coding DNA into the animal, rather than injecting a protein or peptide Tang et al. PubMed: 1545867; Chambers and Johnston PubMed 12910245; Barry and Johnston PubMed: 9234514). The animal's cells produce the protein, which stimulates the animal's immune system to produce antibodies against that particular protein. 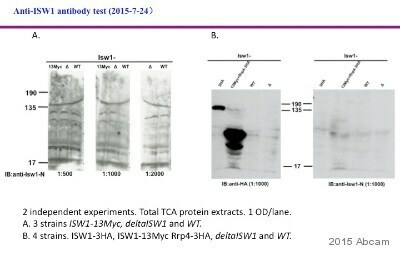 A vector coding for a partial fusion protein was used for genetic immunisation of a mouse and the resulting serum was tested in Western blot against an E.coli lysate containing that partial fusion protein. Genetic immunization offers enormous advantages over the traditional protein-based immunization method. DNA is faster, cheaper and easier to produce and can be produced by standard techniques readily amenable to automation. Furthermore, the antibodies generated by genetic immunization are usually of superior quality with regard to specificity, affinity and recognizing the native protein. Our Abpromise guarantee covers the use of ab43434 in the following tested applications. ab43434 has not yet been referenced specifically in any publications. Publishing research using ab43434? Please let us know so that we can cite the reference in this datasheet.